NeuroDojo: Neuroscience 2011, Day 4. 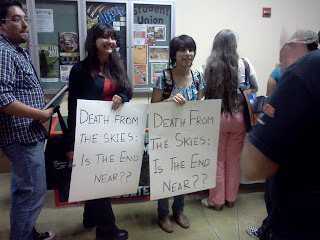 Also, death from the skies. Neuroscience 2011, Day 4. Also, death from the skies. I had just a half day of Neuroscience before flying back to my main campus. Yet again, we were blessed with a November day so mild that I needed no jacket. I walked to the conference center and checked out the last few posters I wanted to see. Some locomotion related stuff, mainly. I retrieved all my goodies from the hotel (Goodbye, fluffy soft hotel pillows and high thread count sheets. I’ll miss you.) and made my way on the Metro the the Reagan airport. I met one student, and waited for my second to arrive. And waited. Yeah. Student was running behind and did not get on the scheduled flight. Oh, crap. Fortunately, she was put on a later flight, and I know she got at least to Houston. My own flight was delayed out of Houston, so I was back rather later than I expected. When I got back home, I went straight to my campus because I had suggested a featured speaker, who was speaking that night. All for this man, Phil Plait, the Bad Astronomer! I got there just as Phil was answering the last couple of questions after his talk. It had thinned out a little, but there was still plenty of people, laughing at Phil’s jokes. 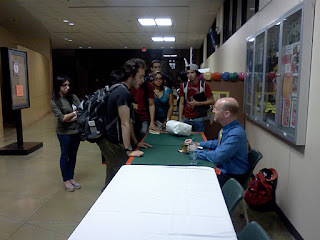 They cut the questions then, but those who had questions were able to ask them when Phil signed books. All the copies sold out, to the disappointment of many. After the books were signed, Phil went out and met with more students from the Astronomy Club. We had a look at Jupiter and the Gallilean moons, the Andromeda galaxy, the Pleides, through the club’s telescopes. I’m sorry I missed the bulk of his talk, but it was great to have him on our campus and I was so pleased to have a chance to chat with him. Down to earth, funny, genuine, Phil is a science star.